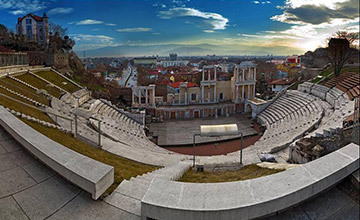 The history of Plovdiv spans more than eight millennia. The numerous nations that lived here have left their traces on the twelve-meter-thick cultural layers of the city. The earliest signs of habitation on the territory of Plovdiv date as far back as the 6th millennium BC. Between the 2nd and the 1st millennium BC a Thracian town was established here and became a fort of the Thracian tribe Bessi. In 342 BC the town was conquered by Philip II the Macedon and after his death the town has been called Philippopolis. In the beginning of 1st century AD the city was incorporated in the Roman Empire and took the name Trimontium. The Roman times were a period of growth and cultural excellence. The ancient ruins tell a story of a vibrant, growing city with numerous public buildings, baths, theatres, a stadium and very well developed ancient water supply system. From this period you can visit the very well conserved Ancian Theater, the Stadium, the Roman Forum and the Eirene Residence. The first Bulgarian ruler who received to capture Plovdiv in 812 AD was khan Krum. A 10 meter high monument of Khan Krum can be seen it Trakia district in Plovdiv. In 1364 Plovdiv became a part from the Ottoman Empire and it was called Filibe. Two mosques remain in Plovdiv from the time of the Ottoman rule. The Djumaya Mosque in the center of the city is considered the oldest European mosque outside Moorish Spain. Under the rule of the Ottoman Empire, Filibe, was a focal point for the Bulgarian national movement and survived as one of the major cultural centers for Bulgarian culture and tradition. It was described as consisting of Turks, Bulgarians, Hellelnized Bulgarians, Armenians, Jews, Vlachs, Arvanites, Greeks and Roma people. In the 16-17 century a significant number of Sephardic Jews settled along with a smaller Armenian community from Galicia. 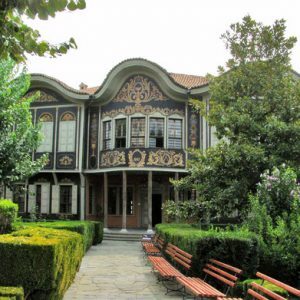 Many beautiful houses from the period of the Bulgarian Renaissance (17-19 century) can be seen in the Old town of Plovdiv. Almost every house here has its characteristic exterior and interior decoration. While you are in Plovdiv, you can get help and more information about the city from one of the two Tourist information Centers in the city. The first one is located in the center of the city, between post office building and Odeon; when arriving in the city via train or bus through “Ugh” or “Rhodopi” stations, this is one of the first buildings you’ll come across in the center of the city. The second one is located in the old city, on the main street (Saborna St), a little bit before the Ethnographic museum and the Church of Saint Konstantin and Elena. There is also an information window inside the train station with the tourist map taped to the wall next to it that you can take a picture of.